This later edition of Braun & Hogenberg's map of London and Westminster was published in Janssen's 'Illustrorem Principumque Urbium Septentrionalium Europae'. The map's title appears in a cartouche at the foot of the plate, replacing the figures of merchants of the first edition. Tudor arms feature top right, with city arms at top left and descriptive notes to the bottom right and bottom left. 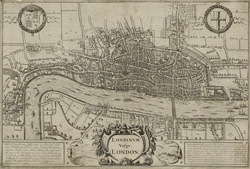 The map is similar in detail to the 'Copperplate Map', the earliest printed map of London of which no complete copy survives. Merchant ships, cranes, mills, bull and bear baiting pits, the large tennis courts at Westminster and the stags in St. James's are examples of London's business and leisure activities. Walled gardens, elegant churches and livery halls testify to the high quality of life enjoyed by its citizens.